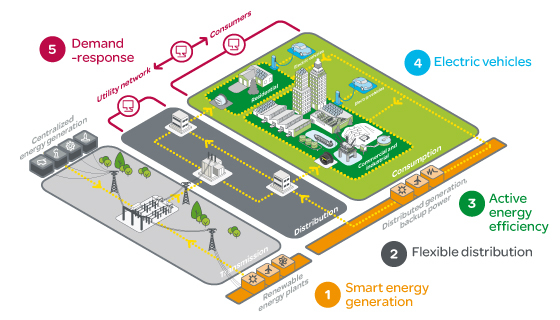 Emerging ¨Internet of Things¨ (IoT) technology plays a central role in building a vital, environmentally friendly energy infrastructure for the 21st century, a future in which local renewable microgrids are likely to figure prominently. France’s Schneider Electric, in turn, intends to earn a place as a leading developer and vendor of energy IoT devices, equipment and solutions. On Nov. 29 management introduced the next generation of Schneider’s EcoStruxure energy IoT architecture and platform. 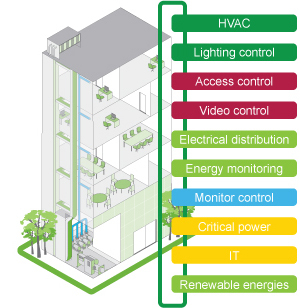 Designed primarily for use in buildings, data centers, industrial facilities and power grids, the new version is open, scalable and provides interoperability across IoT devices, equipment and networks, Schneider highlights, a key point given the lack of market standardization and rapid technological evolution. “EcoStruxure combines our history in pioneering in energy management, automation and deep domain expertise with data-driven metrics and analytics to help us maximize the value of the Internet of Things for our customers,” Schneider Electric CTO Dr. Prith Banerjee was quoted in a press release. Working with Intel and Microsoft, Schnedier Electric took advantage of the latest, commercially proven IoT innovations across a range of associated technologies – mobility, sensing, cloud platforms, analytics and cybersecurity – in developing the latest iteration of EcoStruxure, according to the company. Microsoft: Schneider Electric leverages the Microsoft Azure cloud platform to deliver its digital services, apps and analytics. Azure is the cloud backbone for EcoStruxure, easing technology development on the platform. “Schneider Electric depends on Microsoft Azure IoT technology to rapidly scale public, private and hybrid cloud solutions,” said Sam George, Director, Microsoft Azure IoT at Microsoft Corp. “We’re committed to working together to deliver new digital services that leverage their vast domain expertise in targeted end markets.” One such digital service, Conext 2 Advisor, is a secure monitoring and control solution for managing and optimizing the performance of solar power plants, and is delivered as an Azure cloud-based service, accessible on computers or mobile devices. Intel: Schneider Electric leverages Intel’s smart Field Programmable Gateway Arrays (FPGA) devices to power its sensors and devices, networks and the cloud. Intel’s FPGAs enhance the performance, power and flexibility of the EcoStruxure architecture to enable smarter operations. Schneider is also keen to establish associated partnerships with emerging market specialists and leaders aiming to develop and commercialize new energy IoT business models, products and services, such as those recently established with Zuora and Panasonic, the company pointed out.